I am very much honored to be here and very glad to meet you all, brothers and sisters in Jesus Christ. I cannot begin this morning lecture without the words of deep appreciation for your warm prayers and precious gifts for the Japanese churches, especially those churches in the disaster area. Thank you so much. Now, it was on March 11, 2011, almost one year ago that the triple disaster —- the earthquake, tsunami, and Nuclear Plant explosion —- has stricken us one after another. All the routines in our lives were suddenly stopped and thrown into the turmoil. From that day on, we began to face and struggle with so many problems. I would like to take this special opportunity to share with you some lessons or challenges, both theological and practical, which we have experienced through the disaster. Many of the challenges I will mention shortly, however, were not necessarily new to us. They have been already there just around us in Japanese society even before the disaster. We might have been unaware of them, or we have just ignored them consciously or unconsciously. It seems to me, therefore, that the disaster was not only a big challenge to us but also a God intervened event to wake up the Japanese churches spiritually, and lead them into the true repentance to be truly Christ-like and more deeply reformed by the word of God. Since many relief activities are still going on, and the situation of the Fukushima Nuclear Plant is not settled yet at all, I would like to mention three tentative lessons, among others, which I have learned and am still learning through the tragedy. In the most of recent Japanese churches, people coming to church are not like used to be. Many of them are suffering people either financially or mentally, like homeless men, the mental deceased, Alcoholic, people suffered from domestic violence, etc. They are not necessarily seekers, in the sense that they are seeking for certain truth or interested in Christianity, but seekers for the place where they can feel safe without defending themselves or the place they are accepted unconditionally. Right after the disaster, thousands of people became literally homeless. There were numerous people on the streets wanting foods, mental and spiritual care, and the place where they can feel safe. Thanks to the help of so many Christian people, organizations, and missionaries both within and without Japan, including Mission Japan of South Africa, even very small local churches in the affected region became relief centers to serve their neighborhood and help out people in suffering by delivering foods, waters, whatever they need, as well as mental and spiritual care. Christians in that area have never thought before that they could do anything like this for the community partly because most of the Japanese churches are too tiny and too weak to do so, but more seriously because, I think, our understanding of church ministry and the Gospel itself might be very narrow. But I believe that God taught us by this way what the church of Christ is supposed to be and do in their community. According to Martin Bucer, one of the German Reformers and colleagues of John Calvin, the pastoral care or the diaconal work not only for Christians but potential Christians as well, is the essential ministry or even the identity of the church of Jesus Christ,. It should be holistic, he says, caring a person as a whole, both soul and body, just as Jesus did. As a matter of fact, in the history of missions of the Christian church, countless missionaries have shown this “full” Gospel of Jesus Christ, both intellectually, spiritually, and bodily, by their sacrificial and merciful attitude and deeds, often contributing to the local welfare. 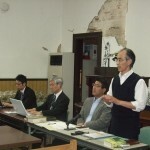 Japanese churches, particularly those in our Reformed tradition, have been too much intellectually oriented to recall their God-gifted potentiality to serve the community more positively, more charitably, and more powerfully. 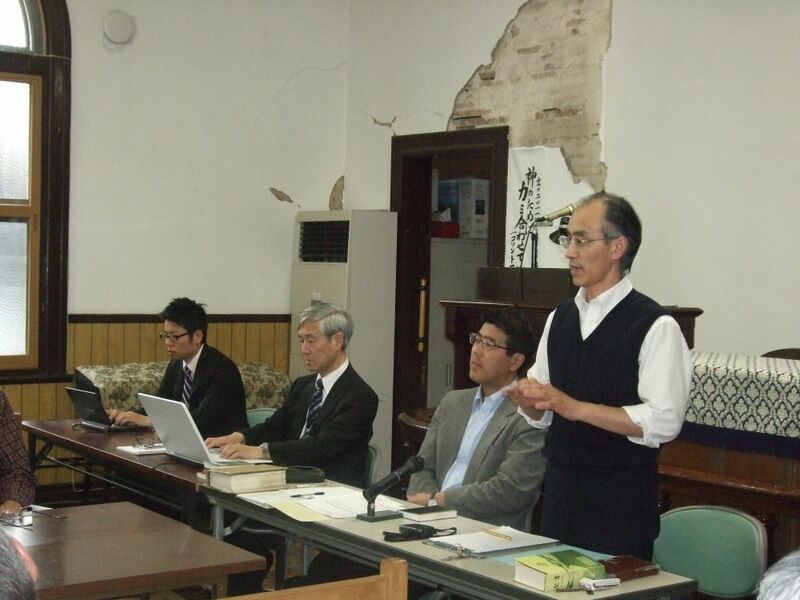 Thanks to God, however, we have been realized this wonderful mission of the church through various kinds of relief works, one of which has been done by East Sendai church, as you saw just before, in which also Tobie and Annalie De Wet have been significantly involved with embodying the love of Christ by their presence and actions. Second challenge, rather than just a lesson, was and is to be a neighbor to the affected people. Being a neighbor, especially to those in suffering, is not easy. It questions us who and what we really are. In other words, it questions the essence of our faith and even our religion itself. This must be a lesson of the parable of the Good Samaritan. We all know that the Samaritans were hated heretic or even virtually pagan to the Jews in those days. Let us imagine if the priest and the Levite who just passed by a poor victim, were Japanese Christian pastors or church officers, and if a Samaritan was a Buddhist or a heretic. This is definitely a scenario that we do not like to imagine. But in our disaster area this kind of things does happen. Just as Jesus said, a question is not what religion they believe, but who is a neighbor to the victim. This story teaches us “a perspective from a beaten person” or “a perspective from the bottom,” so to speak. For him or her, it doesn’t matter who has what religion. Only the one who helps is good. And Jesus said, “Go and do likewise.” Astonishingly, in the parable, the Lord identifies himself with either the beaten person or the Samaritan. Why shouldn’t we? In fact, cooperative relief works by Buddhist monks and Christian pastors or priests have been quite significant especially in the tsunami stricken area. Right after the tsunami hit, many medical doctors and staff came to help the survivors, yet soon they found out that there were not so many things they could do because most of them were fine physically but severely damaged mentally and spiritually caused by the loss of their family and friends. They told us, this is not our job but yours, pastors and priests. It was only one month later after the disaster when the bodies of victims began to be cremated one after another because of lack of gas, but without any religious ceremony. Then Buddhist monks and Christian pastors and priests raised a voice to the city asking to do some kind of ceremony before cremation not for themselves but for the victims or the bereaved family. And the city eventually admitted its significance and gave them opportunities to do so at the crematorium. Later, we also launched an interreligious counseling center, which is still active. It is a well-known fact that Mother Teresa and her colleagues in India took care of the dying people, who were afforded the opportunity to die with dignity, according to the rituals of their faith, that is not always Christian. Honestly, I have been wondering why she did so rather than burying them in the Christian way. But now, I came to understanding that being a neighbor to the victims is first of all, and most of all, to respect their dignity, not ours, considering what they need, and how they feel, think, and even believe. Last, but not least, lesson we have learned is also concerned with the essence of our religion, namely, the power of prayer. I’d like to share two stories about this. Having faced the tragedy beyond our knowledge, we were completely overwhelmed and speechless. In such a tragic situation, just as Job’s friends did, daring to give any explanation on it to the affected people is sometimes even blasphemous. But a prayer is different. It is to speak up to God who is the only omnipotent and omniscient. And to this God, we can not only give gratitude but also throw our sorrow, complains, and even our anger. Despite our ignorance and helplessness, we Christians still know to whom we speak up and cry out, with assurance that our Father does listen to our voices. Many Reformation catechisms, including the Heidelberg catechism, locate the explanation on the Lord’s prayer at the end, along with those on the Creed and Ten commandments. They correspond to Faith, Love, and Hope respectively, according to the Augustinian tradition. Through these experiences I shared, I was reassured that praying our Father in heaven is truly the power of hope, not only for the Christians but also for all God’s children. And this may be the greatest service that we Christians can make. Two days before the March 11th, 2011, was the Ash Wednesday. While we have seen and experienced so many agonies and pains of human beings through early days of the turmoil, we could also keep meditating on the earthly life of our Lord Jesus with suffering people. We don’t know how many years it takes all the turmoil in the stricken area will come to end, and so many people are still agonized and forced to live through this valley of tears or shadow of death. It is nevertheless quite sure for us that our God is with us, and the incarnated God is still walking with us by his spirit even in the midst of our sufferings. This is the most significant lesson we have learned, and the most powerful comfort we have experienced. Those of us who have not been through a disaster such as happened in Japan cannot begin to understand the pain and suffering in the people but thank you Takashi Yoshida for this overview of events and lessons learned – it is most encouraging and we continue to pray for you all as you work day by day with those who are still trying to come to terms with all that happened and may our Lord Jesus be revealed in all that you do and our Father’s name be glorified.